This week I worked along side Blake Rhoades and Hannah Jones. We decided to produce a series of images that reflected Leonard Cohens’s “Hey, That is No Way To Say Goodbye”. The song expresses emotions of loss, distance and processing losing the one you love. We wanted to covey the thoughts and emotions of the protagonist by using multiple layers. As we did not have much time, it was decided that we would each have a layer to produce images for. Hannah - the main portraits that would be the silhouettes, I had the lifestyle images that would reflect the mood, and Blake combined and add the textures. I feel that we came together quite seamlessly as a team, and I am impressed with the outcome of our project, especially considering we had such little time. I was originally going to submit my project idea called Gray. It's one I have been coming back to on and off for quite some time, but have not really found the right way to approach it. The Gray project dives into my family history and is centred around the disappearance of my great grandfather Ben Gray. He went missing in the late '70s and the project explores the impacted it had my family. There is a lot of family folklore around this story, which I find interesting and think it would make an intriguing photo essay. 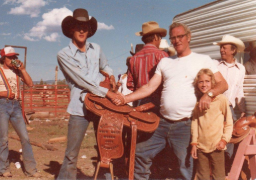 My family were (and some still are) ranchers in Gunnison and the Uncompahgre Valley in Colorado. Ben Gray was quite the cowboy. Along with being known for his rodeos, he was suspected of rustling cattle and horses, which as you can imagine made him not so popular with some people in that community. There are two main stories that I have heard over the years. One is that he was murdered by a hit man hired by his brother, and two that he had a dispute about land, and horses with neighbouring Ute tribe members at the time that lead to him disappearing, and again possibly murdered. I have found it hard to dive into because there is a lot of hypothetical situations and a lot of family, and somewhat social politics involved that I am not sure I want to approach yet. How does this relate to my current project proposal? Two of the biggest themes I find myself drawn to consistently are spaces and landscapes... and the people that inhabit them. Documenting my surroundings and the people in them became a very natural way for me to communicate and connect my UK and US friends and family. Over the years I have noticed that I have always been drawn to the run down, the abandoned, the somewhat lonely looking structures, wild landscapes that paint the picture of the American West and the people that live there or once did. Above is early GCSE and A level work. This is when I started exploring the idea, but at the time it was more reflective of me searching for identity and being an angsty teenager. Naturally. Jumping to current time, this theme is still prevalent and is a strong foundation in all my work. However, now what I am drawn to when I see these places and people, is the impact we have had on the environment and how it has affected past and present generations. High Desert is a project about life in western America, starting in Colorado and exploring other high desert areas, such as New Mexico, Utah and possibly parts of California. *The history of our relationship with the land and how is it now. Is it evolving? *The extremes that come from the high desert environment and how we react to it. *How can we improve the way we use the land, and can we make amends for what we have already done? I love the gentle stillness in his work, and the very classic representation of the abandoned American dream, which I think is hard to avoid when approaching this topic. Her focus on the environment itself is what really draws me in. Also very attracted to the stillness and the sometimes abstract point of view she has of the landscape. They use the abandoned, dystopian backdrop to emphasize a product or lifestyle. The duality of that intrigues me. An organisation building resilient, thriving and inclusive rural economies. Artist Andrea Zittel created a number of pods inspired by NASA mars space tents on her property in the desert near Joshua Tree CA. I think we live in a world where the novelty of photography is still very much present as it was back when it was becoming more accessible in our daily lives. We just happen to live in a time that gives us the ability to build cameras that we can carry around with us, cameras that can produce still and motion all in one - which leads us to produce more images and spend more money on the ever changing gadget, which seems to lead the consumer to believe that there is a need to constantly update, because I feel some believe its the technology that makes the photographer. What challenges has this presented you with? When I first made the leap into the digital photography from the analogue world I did get overwhelmed with the amount of other photographers out there. It was daunting and a big investment, to begin with, but after committing to it and realizing I still had something to offer as a photographer and did not have to give up shooting analouge it was less overwhelming. How have you embraced (or rejected) changing technology? Though I have not given up shooting analouge, I have embraced digital and what comes with it. How do you think the way cameras are marketed affects people’s perception of the value of professional photography? I feel that some people will buy a camera (or use one they have) because they see that as a better way to spend their money and take their our photos, thinking, again it’s the camera that makes the photographer, and sometimes it works out, but by doing that they dismissing the value of your time and skills as a photographer. I think that point of view will always be around, and I feel that it spreads beyond photography. There are a lot of people do understand the value of the professional photographer and are willing to invest. I have recently discovered the work of Afton love and when I did it instantly struck a chord with me. Her work reflects on our connections with the natural world and there is a truth beyond us, and that it is changing as much as we are. I really appreciate that she immerses herself into these landscapes and produces work in multiple disciplines, that can be intricate and labour intensive, yet when finally presented has a beautiful simplicity fills you with wonder. With my work, I have always wanted to have some form of human elemet present, whether it be a person, an item of clothing... a building left to the elements etc, and want to convey similar ideas about how we connect and use our surrounds as a reflection of ourselves. I'm intrigued by how people live their lives and what they leave behind after we have built up the world we want to live in, and a part of me has always wanted to dive deeper into the impact this has on the natural world and the effects it has on future generations. This week was a little harder than I thought it would be but useful, mostly because I have been reflecting a lot on old work, on what/who I was inspired by and how I took that inspiration and used it to communicate within my own work. I have noticed there has always been two layers to my work. One layer is inspired by artists such as Rauschenberg which ties into my desire to relay current happenings of the world around me, not just in a visual sense, but more as a reaction and a way to communicate a mood through texture colour and photo. The second layer is the desire to create simpler images, that still reflects my point of view with the same depth I indent those layers to create. Collin Hughes and Emma Elizabeth Tillman have been my biggest inspiration lately. Both, in my opinion, are connected to their surroundings and deliver intriguing, relatable and beautiful images that draw you in. 2017 was when I really started to think about moving in this direction and started to simplify my images. it has been harder at certain times, epically when the perfectionist in me has not been satisfied. Do you see any parallels between the historic spread of photography and the transmission of digital imagery today? Can you think of any problems associated with the speed at which the photograph moves? I often think about how photography has been used in the daily lives of people since it became an accessible medium that most anyone can use as a form of expression and documentation. In my opinion, photography, to this day still has a grasp on us the way it did when in the 1800s and I feel that, it is very much human nature to want to share our lives be it curated, an honest documentation or a projection of a lifestyle that we want to be associated with, with people within and outside of our social groups. The difference today is that we have the technology that allows us to produce and consume images faster than before that the value and impact of the image, I feel can sometimes be missed. Which makes the subject of the photo easy to be overlooked or misunderstood. What do you make of the mirror and window analogy? As a practitioner do you identify more closely with one or the other? As a photographer I use my work mostly as a window. I have always been interested in using my camera as a way of communicating from day one. My interest came mostly out of a desire to connect with my family, friends, and myself. I was born in the US and raised in the south of England, two very different worlds that I wanted to understand each other, and photography was a very natural way for me to form that connection, by capturing small parts of that daily life from each side. I still aim to do that with my work now, but I realize that the photo you want to create as a window, is very much a reflection of the situation you create as the photographer. A gathering to say goodbye to my father in law, who passed away a few months before. // June 2016 // Wyoming USA.